The Mysterious Affair at Styles 1945, Avon 75, 226 pp. Murder On the Links 1949, Dell 454, 224 pp. The Man in the Brown Suit 1949, Dell, 223 pp. The Secret of Chimneys 1947, Dell 199, 224 pp. The Big Four, 1941, Avon 3, 276 pp. The Mystery of the Blue Train 1940, Pocket 38, 276 pp. Partners in Crime 1963, Dell, 224 pp. The Mysterious Mr. Quin 1950, Dell, 256 pp. Murder at the Vicarage 1948, Dell 226, 223 pp. Murder at Hazelmoor, 1950, Dell 391, 224 pp. Peril at End House, July 1942, Pocket 167, 240 pp. The Tuesday Club Murders, Dell 8, 238 pp. 13 at Dinner, 1944, Dell 60, 224 pp. Murder in the Calais Coach, 1940, Pocket 79, 246 pp. Mr. Parker Pyne, Detective, 1951, Dell 550, 224 pp. Murder in Three Acts, 1945, Avon 61, 230 pp. Death in the Air, 1946, Avon 89, 259 pp. The Boomerang Clue, 1944, Dell 664, 224 pp. The ABC Murders January 1941, Pocket 88, 236 pp. Murder in Mesopotamia 1944, Dell 145, 240 pp. Cards on the Table, 1949, Dell 293, 239 pp. Dead Man's Mirror, 1958, Dell, 190 pp. Poirot Loses a Client,1945, Avon 70, 260 pp. Death on the Nile 1944, Avon 46, 262 pp. Appointment with Death 1946, Dell 105, 192 pp. 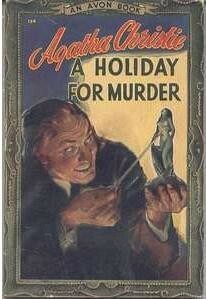 Murder for Christmas, also published as A Holiday for Murder, 1947, Avon 124, 255 pp. The Regatta Mystery 1946, Avon 85, 232 pp. Easy to Kill, 1945, Pocket 319, 174 pp. And Then There Were None, March 1944, Pocket 261, 186 pp. Sad Cypress 1946, Dell 172, 224 pp. The Patriotic Murders, 1943, Pocket 249, 214 pp. N or M? 1947, Dell, 191 pp. Evil Under the Sun 1945, Pocket 285, 183 pp. The Body in the Library, 1945, Pocket 341, 150 pp. Murder in Retrospect, 1948, Dell 257, 192 pp. The Case of the Moving Finger, 1948, Avon 636, 158pp. Towards Zero, 1946, Pocket 398, 202 pp. Death Comes as the End, 1947, Pocket 465, 224pp. Remembered Death, 1947, Pocket 451, 218pp. The Hollow, 1948, Pocket 485, 280pp. The Labors of Hercules, 1951, Dell 491, 255pp. There is a Tide, 1949, Pocket 617, 248pp. The Witness for the Prosecution, 1955, Pocket 855, 192 pp. Crooked House, 1951, Pocket 753, 200pp. Three Blind Mice & Other Stories, 1952, Dell 633, 224pp. A Murder is Announced, 1951, Pocket 820, 229pp. They Came to Baghdad, 1952, Pocket 897, 215pp. The Under Dog & Other Stories, 1955, Pocket 1085, 164pp. Mrs. McGinty's Dead, 1953, Pocket 956, 196pp. Murder with Mirrors, 1954, Pocket 1021, 165pp. Funerals are Fatal, 1954, Pocket 1003, 224pp. A Pocket Full of Rye, 1955, Pocket 1036, 186pp. So Many Steps to Death, 1957, Pocket 1114, 183pp. Hickory Dickory Death, 1956, Pocket 1151, 152pp. Dead Man's Folly, 1957, Pocket 1174, 178pp. What Mrs McGillicuddy Saw!, 1958, Pocket , 185pp. Ordeal by Innocence, 1960, Pocket, 211pp. Cat Among the Pigeons, 1961, Pocket, 216pp. Double Sin & Other Stories, 1962, Pocket 6144, 181pp. The Clocks, 1965, Pocket 50442, 246pp. A Caribbean Mystery, 1966, Pocket 50449, 176pp. 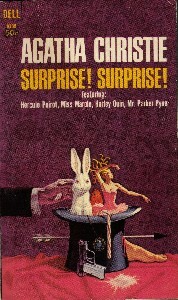 Surprise, Surprise, Dell, 1966, 223pp. At Bertram's Hotel, 1967, Pocket, 180pp. 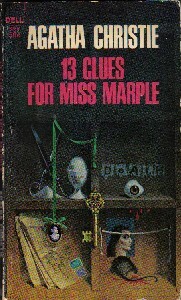 13 Clues for Miss Marple, 1967, Dell, 192pp. Third Girl, 1968, Pocket 55351, 218pp. Endless Night, 1969, Pocket 55363, 181pp. By the Pricking of My Thumbs, 1969, Pocket 73419, 208pp. Hallowe'en Party, 1970, Pocket, 185pp. Golden Ball & Other Stories, 1972, Dell, 235pp. Elephants Can Remember, 1973, Dell, 237pp. Postern of Fate, 1974, Bantam, 276pp.